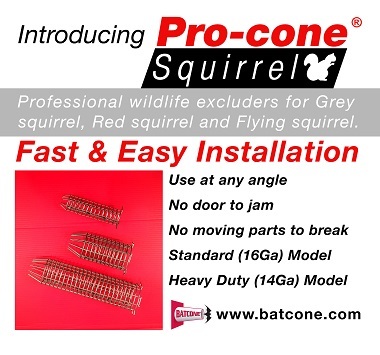 Pro-cone Corner is a multi-use, reusable, exclusion cone that can be used for multiple wildlife species including Bats, red squirrels, flying squirrels, sparrows, starlings, rats and mice. 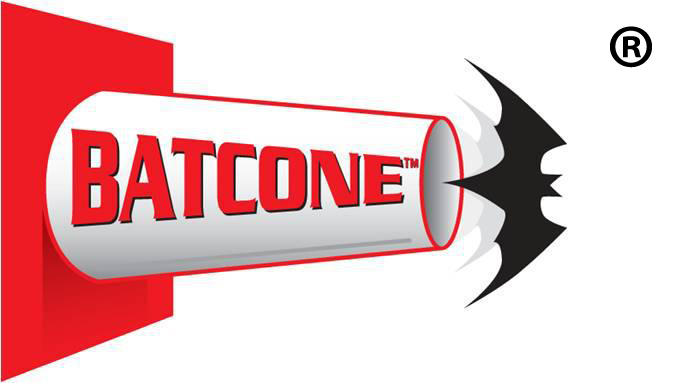 Getting rid of animals, such as bats or squirrels or even birds, from your attic, crawl space, or other location within your home is possible with the Batcone system. There is no longer any need to have the animals killed in order to keep your home safe and pest free. However, there are a couple of different exclusion cones that you can use for your home and one of them is the Pro-cone Corner. Some homes are designed in such a way that a traditional bat removal devices that one might find in the marketplace could be an eyesore, especially if it is placed in the middle of the home’s siding or other obvious structure. The Pro-cone is made of a clear material so it almost disappears when mounted on a structure. It also looks professional when using them. The Pro-cone wildlife excluder by Westchester Wildlife is a multi-use, reusable, exclusion cone that can be used for bats, birds, and flying squirrels. Made of durable CLEAR polycarbonate these cones can be used over and over for exclusion work. In addition to being mostly unnoticeable on your house, is quite effective. Where you place the Batcone exclusion system will depend largely on where your uninvited guests decide to enter and exit the home. Available in three different shapes to fit any situation. The Pro-cone is a quick and humane method of bat removal. The most common locations for these small animals to nest within homes in the Northeast United States are the attic. They can also find some comfort and shelter in crawl spaces that go largely forgotten. However, inside of the walls of the home are also potential nesting grounds for mice and other rodents. Bats and birds will generally prefer the warm comfort of the attics, especially given the relatively easy access they have to the space. In many homes, construction doesn’t consider the future potential for these animals to get into the home and there are many gaps in the eves and around ventilation structures. There are also gaps along the corners of the homes, near the roof and this is where a Batcone Pro Corner system will come in handy. The Pro-cone Corner addresses the common entry and exit points that are created by these overlooked construction points. If the bats or birds or other creatures are finding access to the home in the corner near the roof, closing it off (sealing it up) and installing a Corner, Round or Square Pro-cone along another portion of the house may create the desired effect. You want animals to find alternate exits or they could die within your home, which is precisely what exclusion aims to prevent. The Pro-corner is a ruggedly designed exclusion tool that is ideal for those homes in which the animals are entering and exiting through these particular sections of the house. Birds and bats are creatures of habit and will likely seek out the same section to enter and exit. If you are trying to decide on whether to use a straight or corner Batcone exclusion system, first study the animals to determine where they are gaining access to your home. There could be two points of entry or more. If they are using a corner of the home, then this is certainly a reason to use the Pro-corner in your exclusion efforts.